We may sound like a broken record since we’ve said it so many times, but there are few nameplates in the entire industry (regardless of segment) that are as respected as the Chevy Silverado. The renowned pickup truck has brought home a number of accolades over the years, and the nameplate’s consistency has proven that it belongs in the upper tier among pickup trucks. This will prove to be the case once again in the 2019 Chevy Silverado. While we’re still awaiting full details on the specifics, there will be plenty to be excited about when the truck hits dealership lots. Customers can expect the truck’s noteworthy performance, worksite accessibility, and top-notch technologies. This variation of the 2019 Chevy Silverado has been built to overcome any obstacle a driver could possibly come across. Whether you’re attempting to drive through inclement weather, travel off the beaten path, or get through a busy commute without any dents or dings, the High Country version of the beloved pickup will prove to be the perfect choice. Specifically, the vehicle is composed of a “high-strength, roll-formed steel,” assuring that your pickup truck will always keep you safe. This variation of the nameplate also includes a number of amenities that are intended to improve convenience, especially if you’re going to be relying on the vehicle as a worksite companion. The brand’s new Durabed is meant for functionality, assuring that you’ll never come across any issues when transporting construction aggregate or tools during your journey. Meanwhile, the accompanying 12 tie downs are each capable of securing up to 500 pounds. There’s even a CornerStep bumper, assuring that you’ll never have any issues entering and exiting your ride. Finally, there’s a 120-volt outlet to help you keep all of your tools and gadgets fully juiced, while the LED Rear Task Lighting will allow you to complete jobs at any time of day. When you comprehend all of the amenities that Chevy’s engineers provide to customers, it’s clear why the 2019 Silverado is the epitome of a worksite companion. Chevy’s engineers somehow provide customers with the ability to choose from three different engine options as they’re preparing their brand-new 2019 Chevy Silverado. Each of these offerings provide their own specific benefits, and none of the trio of engines should be considered a bad choice. The 6.2-liter V8 engine is the most hulking of the bunch, and this sentiment is confirmed in its power specs. The system is ultimately capable of pumping out 420 horsepower and 460 pound-feet of torque. Couple these numbers with the intuitive 10-speed automatic transmission, you’re looking at one of the most enjoyable vehicles in the class. Plus, thanks to inclusions like the Auto Stop/Start technology and the Dynamic Fuel Management, the system manages to deliver respectable fuel economy numbers. Next on the list is the 5.3-liter V8 engine, which can either be equipped with Dynamic Fuel Management or Active Fuel Management (each of which will help to cut down on gas consumption). The system can crank out a respectable 355 horsepower and 383 pound-feet of torque, and it can either be equipped with an 8-speed automatic transmission or 6 -speed automatic transmission. Finally, the 2.7-liter Turbo engine is for those seeking maximum efficiency. Thanks to the Active Fuel Management and Auto Stop/Start technology, drivers will be able to capitalize on the practically unmatched highway fuel efficiency. Despite the top-notch fuel economy, the system is still capable of cranking out 310 horsepower and 348 pound-feet of torque. Customers rarely have a chance to choose from two engines as they’re building a new pickup. Chevy is pushing the limit and providing potential buyers with three impressive options. Of course, thanks in part to those three engine offerings, the 2019 Chevy Silverado is a towing behemoth. The vehicle is more than capable of hauling any goods you need to bring on your journey, thus making the nameplate one of the most versatile offerings in the entire segment. When customers opt for the Advanced Trailering Package, they’ll be able to capitalize on a number of features that will make towing a whole lot easier. The Trailer Light Test and Hitch Guidance feature (with Hitch View) will surely boost convenience, while the Theft Alert and Trailer Tire Pressure Monitoring system (both of which come via the Trailering App) assure that your Chevy Silverado is always safe and secure. Customers can also opt for the Trailering Camera Package, which allows drivers to monitor everything that’s happening around their pickup whenever they’re towing. The main amenities are the side view cameras and the hitch view camera, allowing drivers to visualize everything that’s happening around their ride. The system also includes a port for an accessory camera. Towing certainly isn’t for everybody, but few vehicles are able to deliver the numbers that the 2019 Silverado can. If you end up opting for the pickup truck, perhaps you’ll be pushing to haul some cargo in the back of your ride. Of course, similar to many of Chevy’s vehicles, customers can expect the 2019 Chevy Silverado to boast some of the most technologically-advanced interior amenities in the entire class. For instance, the Chevrolet MyLink system provides everything a driver could possibly want from an infotainment unit. The touchscreen system lets owners access whatever application they’re seeking, whether it be radio, navigation, or another helpful program. Plus, thanks to the Apple CarPlay and Android Auto compatibility, drivers can easily connect their smartphones. These inclusions allow drivers to stay connected at all times, and they won’t have to compromise safety to do so. The truck can even be equipped with 4G LTE Wi-Fi. Thanks to this inclusion, owners will be able to access a strong wireless internet connection regardless of where they are. Plus, with the ability to connect up to seven devices, you may find that your Silverado is a popular hangout spot at the worksite. Finally, in the brand’s pursuit of keeping drivers connected, the myChevrolet Mobile App leads the way. Silverado owners can constantly monitor their vehicle, even when they’re away. The application allows you to lock/unlock doors and start/stop the engine remotely, and you can even send directions directly to your navigation unit. Pickup trucks aren’t usually known for their technological features. 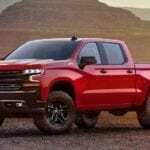 However, Chevy is doing a whole lot to erase that sentiment, as the 2019 Silverado will keep drivers connected at all times. If it wasn’t obvious before, it should be pretty clear now: Chevy has once again hit a home run with their 2019 Silverado. There’s plenty to be excited about when it comes to the upcoming pickup, whether it’s the incredible engines, the towing ability, or the innovative technologies. Since you’re probably now jacked up on pickup specs, maybe you should take that trip down to your local Chevy dealer. Will the 2019 Chevy Silverado Live Up to Every Expectation? Previous post: What’s Changed In The New 2019 Ford F-150?